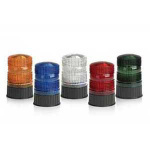 Federal Signal’s Renegade® strobe beacon set the standard for dependability and performance. The 2.2 joule, double-flash power supply automatically adjusts to function at any voltage from 12 to 48 VDC. For effective long-term operation, the Renegade has a powerful replacement strobe tube and vibration-resistant circuitry board. This strobe beacon has exceptional optics to meet SAE J845 Class 3 specifications.